Craigslist is a great way to promote your business. Craigslist gets more than 4 billion page views per month! This huge amount of traffic can help invite customers your way. Craigslist is a free and extremely powerful advertising tool. If you are going to dedicate the time to advertise on Craigslist, make your listing stand out amongst the many with a professional-looking ad. We can design for you a custom Craigslist ad that is sure to bring you more leads! Along with the ad, we can also assist you with your website design. With an estimated 10 million visitors and 4 billion page views each month, Craigslist ads offer you an incredible opportunity to profit from showing your ad to literally thousands of targeted customers. If you couple this remarkable service with our creative Craigslist ad designs, you are sure to draw more attention, look more professional, and get more response. User testing reveals that high-quality graphic design is essential to converting visitors into leads. Having the right look lends credibility to your brand and your business. Besides that, a plain text ad is just that: plain. Our team of developers and designers can change the look of your plain text ad into a crisp, clean ad sure to stand out. You owe it to your business to have a fresh, well-designed image with detailed information that provides a link to your website. Craigslist, while a free and effective advertising tool, only works if your ad stands out. A customized ad will capture those people just skimming through the numerous text ads on Craigslist and give them a direct “call to action” for your specific product or service. 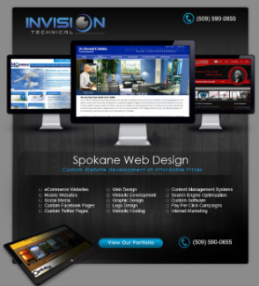 Take the first step towards letting Invision Technical create a website strategy for your business. Click here to receive a Free Quote.